Helensburgh is a gorgeous town in the mid-west of Scotland (near Loch Lomond) and a approximately half an hour from Glasgow. Helensburgh is on the water of Gare Loch is a typical seaside town in every sense – clear sea air, a beautiful view and lovely locals. La Barca was recommended to me and we found it in the main street which looks onto the water. The restaurant is bright and spacious, but at night it’s dim and cosy. I arrived with my friend, mum and mother in law for a cosy evening dinner after a lovely day. We ordered enough to sink a small ship….and ate it. My usual tapas haunts are Cafe Andaluz and La Tasca (specifically the one in Silverburn. I feel that’s noteworthy!) – La Barca is the first non-chain tapas bar I’ve tried and I loved it. I’m starting with this dish as I want to end on a positive note, and I simply didn’t like these at all. They’re described as ‘drunken’ goats cheese in breadcrumbs, deep fried and served with homemade tomato and onion chutney. I’m not sure if the alcohol involved altered the taste negatively but it tasted synthetic, like something from a frozen bag. This was the only dish I didn’t like. I never order paella because it fills me up, but I sneakily smile whenever someone in my company does. I love to sneak a little bit! The make of good paella for me is a range of flavours, nice moist rice and tender meat/vegetables. All boxes ticked! Since my Wham Bam Thankyou Lamb day I’ve taken a real notion of meatballs, and in fact I’ll be doing a recipe about some meatballs shortly. 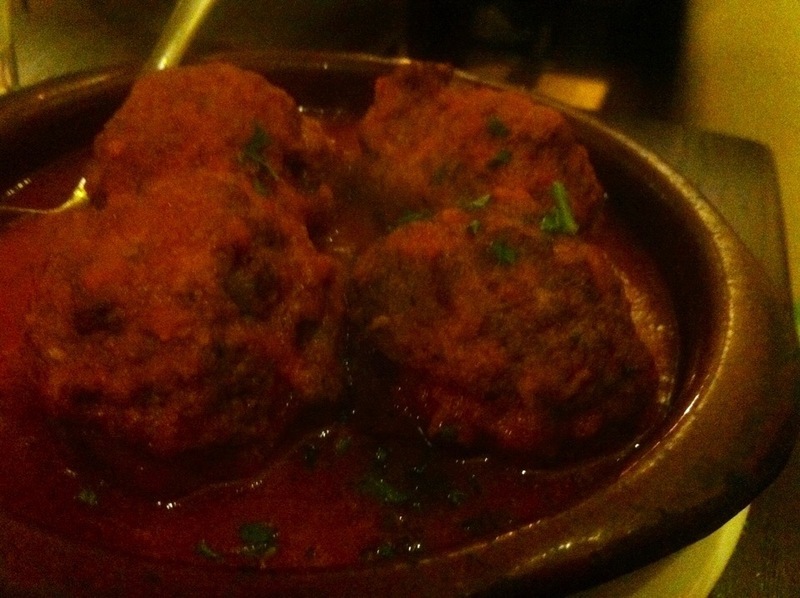 To date, these are the most delicious meatballs I have tasted. They’re made from spiced beef, lamb and pork which are slow-cooked in a rich tomato sauce. They were absolutely gorgeous! This was absolutely gorgeous. A rich tomato, garlic and white wine sauce baked with aubergine and then topped with a creamy béchamel sauce and goats cheese. It’s so hard to describe this, as it was just so delicious and had so many layers of flavour. All I can say is that I highly recommend some of this on the same forkful as the meatballs. You’re welcome! Pescado Frito is my favourite dish from La Tasca. It’s the most delicate but delicious battered fish I’d ever eaten. Light as air and incurably moreish. Deep fried strips of white fish in beer batter, served with roast garlic mayonnaise and lemon – the perfect tapas dish because you don’t feel full but you get all the other benefits of food: taste and joy. This is a Spanish white bean stew which is flavoured with chorizo and black pudding. I found this to be a strange idea, but it’s absolutely gorgeous. Black pudding is something I considered to be a Scottish dish, or British at a push. I thought that this was maybe a clever Spanish-Scottish infusion. As it happens, most countries have black pudding! Random fact for those who didn’t know! The stew was beautiful with a good kick to it, with seriously deep flavours from the chorizo and black pudding. Grilled pork skewers marinaded in paprika and garlic. The photo isn’t up to much (my companions had started to eat!) but these were really nice – spicy, garlicky pork. They were a touch dry, but nothing a dunk in some of the other tapas dishes/chutney couldn’t remedy! I absolutely love pil pil. Chilli, garlic and prawns are like my holy trinity! I can’t say too much about this, because really, you can’t go wrong! I really want to get a baby skillet like this so I can serve food in it sizzling. Sizzling food is the best food. I ordered this because of an obsession I’m having with a focaccia bruschetta. It sounded fairly similar, give or take a few ingredients, so I thought it was worth a try. It was divine. The Catalan bread is toasted and topped with grated beef tomato (I’d imagine grating a tomato would be a really frustrating experience, but their labour of love paid off! ), extra virgin olive oil, garlic and coriander. Mucho bueno! We were served by two staff members and they both were warm, friendly, had a sense of humour. The staff were really attentive and gave us fantastic service. I thoroughly enjoyed my meal – the food was top quality and bursting with flavours. I’m planning on going back next time I fancy tapas. The meatballs and baked aubergine are calling my name!